So, your boss dropped a bundle sending you and two colleagues to Vegas for the Big Show. and finally into a very so-so room at the Venetian. …You’re already exhausted. Welcome then to the onrushing age of the smart event. Well, maybe not this year or next, but sometime soon in the 2nd decade of the 21st century most major events will have gone digital or they may not be around. Why would anyone fork over the cash for an expensive event pass, plus pay airfare, hotel and all the rest for the same old, circa 2019 event experience? Total cost of attendance at most events is like $5k, right? 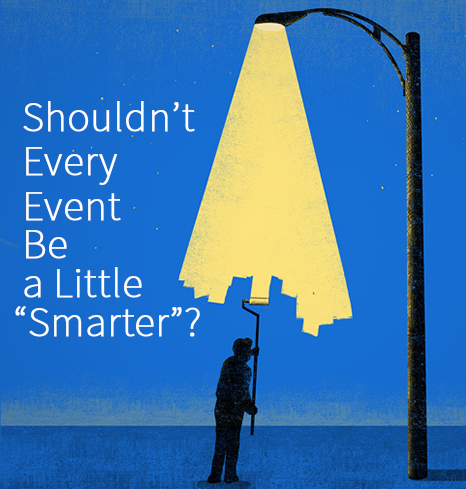 Smart events will be the only way that attendees can properly max out their ROI. Dave Limp, Amazon’s Alexa exec, says that 100 million Alexa devices are in the hands of consumers. Add video, like Amazon’s Echo, and 100 million people could theoretically attend CES2019; that is, if CES was set up to greet them, which it isn’t. Research is showing that 2020 is to see some 30 billion connected devices in the world, which means that lots of people and digital things will also be mightily connected. By 2020 then, will any attendee abide any event that is not as digital as the attendees themselves? Is there a better way than walk-till-you-drop events? With that in mind, what better platform to go “smart” than the largest consumer electronics show on the planet? CES already sports some two-million square feet of electronic “digital” devices every year. Why stop there? At the very least, connect them all! That’s how the digital fun begins. So, a digital connectivity “trend” may play itself out at CES2019 in front of an audience that is the best connected in history. If “events”, in order to be relevant, need to mirror what’s happening with consumers, is CES2019 as connected as it should be? No, not by a long shot. However, with CES2019, we could be on the cusp of a new CES experience. It’s one that won’t manifest itself for a while, however, we’ll all be able to sense the onrushing possibilities while strolling the exhibit halls this January. Just look for what’s missing. While strolling CES 2019, squint a bit to get a sense what is to come. Immediately noticeable and the single-most constant that won’t go away between CES 2019 and CES 2020 will be the level of cacophony. Decibels will still be off the charts in 2020. But hey, it’s an event. We’ll get over it. Salvation amid the dissonance will be wireless, noise-cancelling earbuds that will render the discord into a mild, almost pleasant background hum. Connected, directional earbuds will tune us in to distraction-free conversations with mates …as well as chats with booth personnel about their to-die-for electronics. Just scan the QR code on the booth, and you’re in. Your ear buds will connect you to the booth crew. Need a data fix? That same CES booth request will prompt a cascade of analytics on the booth personnel and their company (including their LinkedIn pages and WSJ news flashes), info on the company’s electronic products, instant comparisons between their gizmos other similar CES 2020 gadgets (plus maybe a consumer review or two to download); and if needed, even a set of probing questions to ask if conversation or the gizmo or both are fails. And, of course, the questions will be available as print or audio or both, and translated into any of thirty-two languages. Ask your Smartphone to help by sorting every booth and product for any that match your interests. If it gets to be info overkill, go off grid and stop the flow at any time. Want to cherry pick your booth tour? Tap into the CES 24×7 video and radio streams. Search the streams for any interviews with notables or ask for the Hot Picks menu of most trafficked booths. Or, simply let an algorithm do all the heavy lifting for you. Keep sorting until you match the optimum number of booths to your available time, energy, and productivity limits. The onset of fatigue is a good sign to take a coffee break. But, of course, coffee breaks won’t be coffee breaks at CES 2020: they’ll just be more work but with a latte chaser. More like quiet times spent with a digital device or two catching up with who and what you’ve missed or have scheduled next. Swig down that frothy latte and it’s off again to the show floor. Just want to amble around and chill during your CES walkthrough? No schmoozing, just eye candy and music? Your cell will recognize your mood and play appropriate musical accompaniment. Just make sure your shoes are comfortable. Your cell will also update you as to when your attention span has been maxed out. Mental efficiency trending down, is it? Bad for productivity. Tsk-tsk. Power down your personal system and rest up for a while. But then again, you didn’t spend big bucks to come to CES Vegas to rest up. CES 2020 will be the first all-VR (virtual reality) CES event. VR in 2020 won’t resemble 2019 with a Smartphone perched on everyone’s nose. Goggles, or small, unobtrusive eye cups will be in vogue. Tens of thousands of attendees sporting shades—reminiscent of the sea of 3D glasses at movie theatres—will give the CES 2020 expo an eerily chic vibe where no one makes eye contact because it’s impossible to do so. And that’s another reason why we’ll not see driverless cars from BMW or Mercedes or Tesla or any manufacturer; there won’t be any need for them. Instead of rolling us around on a slow figure eight in front of the Las Vegas Convention Center, totally immersive VR with haptics will whisk us through a high-speed test track in Stuttgart. VR will make for a much better visitor experience: Mercedes would much prefer thrilling you in Stuttgart than boring you in Vegas, especially if the thrills are delivered over extremely high-definition, or 4K. Plus, there’s never a waiting line for a ride. 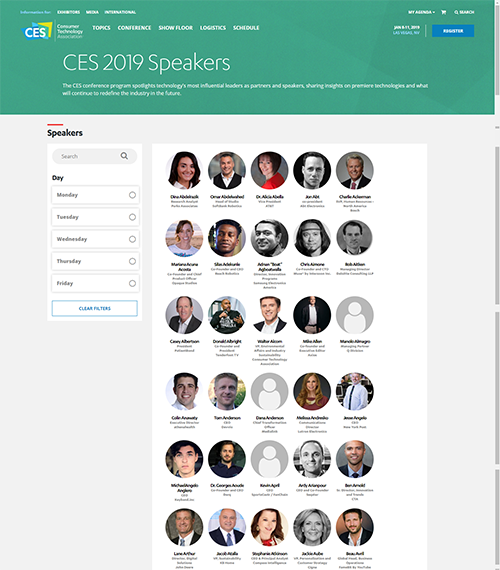 Then too, check out this lineup of CES2019 speakers; there are quite literally hundreds! Each, not doubt, has a thing or two to share that might be of interest to the CES throngs, but which ones are the most relevant to attendees? How does any individual intellect parse all of their content and serve up what’s truly important to each individual? CES2019 can’t do that. Artificial Intelligence at CES2020 might be able to. Could AI parse speaker content and then serve up only the choice stuff that matters? That alone would be worth the price of admission. Then again, no one has to be in Vegas to take advantage of the collective knowledge and experience from 500 or so speakers. Millions could attend CES via a digital device, …and none would have sore feet. Or, if there, one could easily review all that was missed or overlooked (and it’s a lot!) back at the hotel over cognac…and store all the gems in the cloud for later. Smart move #3: No more remotes! Can anyone even conceive of a world without remotes? Hard to imagine, but in the nearly two million square feet of CES 2020 exhibit space, you won’t find a single remote. They’re finally history! Couch cushions the world over will no longer get blamed for harboring those elusive hunks of plastic with all the crazy buttons. Want to interview a machine, any machine at CES? Their chatbots are ready when you are. Every electronic gizmo, gadget and appliance at CES 2020 will be imbued with a little or a lot of intelligence. Everything will be speech-enabled and capable of holding two-way conversations with anyone and everyone…in any language. The ultimate remote—the human voice!—will obsolete every mechanical control around. Lots of data will be flowing from all of these connected devices and people: nearly four thousand exhibits and 150,000 people. If it were all connected—smart device to smart human times thousands and thousands—imagine the data flow coursing through CES 2020. Imagine having access to all the data? Imagine algorithms sifting it for juicy chunks of actionable info? Imagine what all of that info would do for the fine art of networking? No longer would networking be hit or miss appointment making for a rendezvous at Tech East or Tech West, most of which turn out to be duds. Serendipity can be excitingly magical, but not when pressed for time in jam-packed venues full of electronics. The surety of AI working on data for a defined objective will completely transform networking and the reasons why people go to events. What would attendees pay for that networking capability? The CES app for 2020 will be much in demand. Fortunes are to be made, that’s for sure. 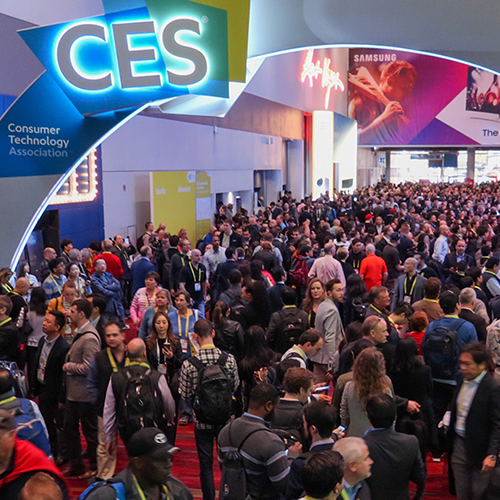 While ambling through the bright lights and electronics of CES 2019, think about how much better it would be if it was just a teeny bit smarter. You’d pay extra for a smart event, wouldn’t you? Put it this way: In the future, chances are that you won’t even consider going to any event that isn’t a smart event. And 2020 is next year!